I don’t know if they still have them, but several times in the past I’ve been to the US and noticed signs by the customs desks with say “Don’t joke with the officers, you will be deported”, or words to that effect. Good to see, then, that our home grown UK Borders Agency can see the light hearted side of its work with this headline. 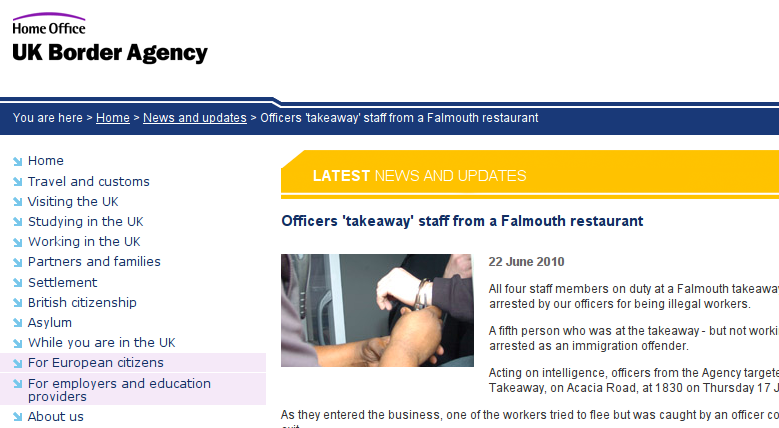 “Officers ‘takeaway’ staff from a Falmouth restaurant”. I’m glad for them that they aren’t so overwhelmed by the sensitive task of dealing with refugees that they can’t laugh about their work, eh? Or maybe I’m not the one who should be being empathetic? Bringing up the fact that my brother-in-law was beaten up for being Asian just down the road from their and the idea that perhaps a more responsible attitude might be needed to deal with the tricky problem of race in Cornwall would just be a little bleeding heart, wouldn’t it?